A New Jersey doctor won permission from the New Orleans City Council last week to tear down two small homes on Benjamin Street to make room to build a new home on the entire Cherokee Street lot, over the objection of the city’s historic-preservation staff. 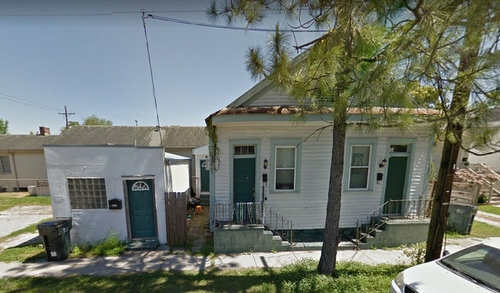 The two houses at 7463-65 and 7467 Benjamin Street actually sit on the rear of a lot that fronts on Cherokee Street, recently purchased by Gary Wasserman, a Tulane-trained urologist who practiced in New Jersey. The buildings are “ramshackle” structures that Wasserman wants to demolish so that he can build a 2,900-square-foot home on the 301 Cherokee Street lot, said architect Brian Gille. The smaller building at 7467 Benjamin is not considered historic, but the larger one is a one-story double shotgun built in the early 20th Century that does contribute to the character of the neighborhood, said Elliott Perkins, director of the Historic Districts Landmarks Commission. For that reason, the HDLC recommended that the smaller structure be demolished, but not the double at 7463-65 Benjamin. Gille — describing himself as a “preservationist at heart” — said he disagreed with the HDLC finding. The empty portion of the lot on Cherokee currently creates a “missing tooth on the street,” he said. Further, if the Wassermans were forced to keep the larger home, the resulting land use would make no sense, forcing the single-family home to coexist with the double shotgun on one lot, Gille said. “All we’re asking for is to be able to take these two dilapidated buildings down so that we restore 301 Cherokee to what it originally was, which was a 30-by-120 lot,” Gille told the City Council on Thursday (July 27). Wasserman assured the Council that he is not “an out of state investment company looking to house flip” — he bought it using an LLC for financial reasons, and has no ties to any property-investment company, he promised. He trained at Tulane Medical School, his first child was born at Baptist hospital, and he now has children who live here, while his wife’s family is in Harahan, he said. City Councilwoman Susan Guidry said the decision was “difficult,” but she believed the council should override the HDLC and allow the demolition. The Wassermans’ plans for a “beautiful” house built by Gille simply make sense than the odd collection of structures currently on the site, she said. The council voted 5-0 in favor of the demolition. HORRIBLE! Looks like Guidry has checked out or was paid off. How many more historic homes are going to be lost before someone shows some leadership? Historic preservation is dead in New Orleans. If this doesn’t stop, we’ll be looking like Dallas pretty soon. I don’t see anything worth saving. A very plain, small double shotgun and a shed. Is it hiding some kind of old growth cypress and heartwood pine underneath the rusty tin roof? If they care about history, tell him he has to build in Victorian, Italianate, Neoclassical, or some other historical style. Then put the monuments back up.